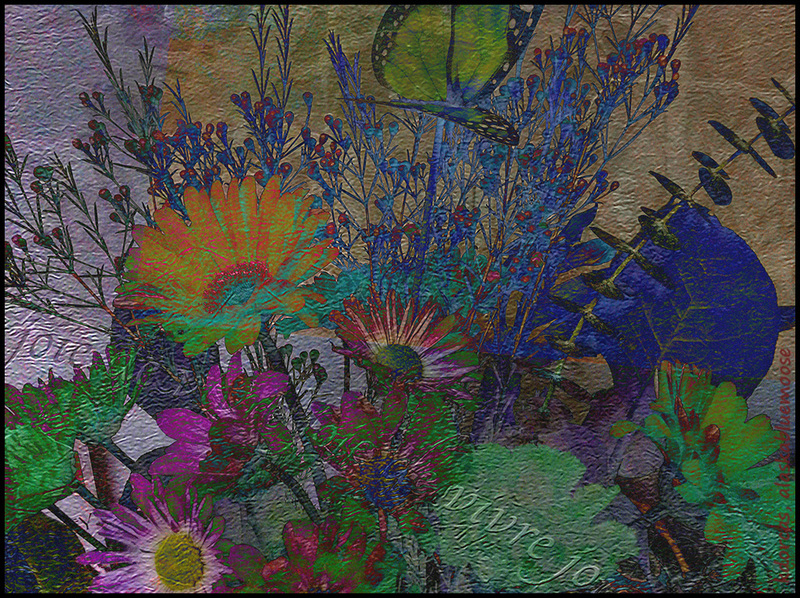 Photo Art Friday due with Bonnie's "Joie de Vivre" pdpa texture. I used the beautiful flower bouquet that Jaci gave me last night and had fun with the difference mode. You really should check out the link to the challenge today because Bonnie did some crazy neat manipulations that you might enjoy playing with. I truly love the coloration that resulted from your blend mode. The composition is so nice too. I'd like to paint it. Gorgeous hues: bright yet subtle. so lovely and would never have guessed this is the same bouquet! Great fun Karen!. Have a warm weekend. How fun and what wonderful colors your blending and experimenting turned up. I like it. I love it. A wonderful blend of colors on this lovely composition. Really lovely edit - love it! Isn't it fun to receive a bouquet - knowing we can enjoy it's beauty and then create even more by photographing and editing it? Lovely Karen. Thank you for sharing with Photo Art Friday. Beautiful, beautiful,beautiful!!!! You will have to teach me this process!!! Karen, this is a beautiful piece of art. You should frame and hang it! What a difference the mode made! As beautiful as the 'real' bouquet. This is lovely karen. So intricate and rich. I'm surprised I missed you last Friday. What happened?! How did I miss Friday?! I can't believe I didn't play along this week - BUT, I do get to see your efforts and like the bright, unexpected results. Saw the flower arrangement in your earlier post - it's gorgeous! Lucky you.